Jonathan Toews and Patrick Kane have brought the fans back in Chicago. Dale Tallon wasn’t about to store away his golf clubs just because he took on the biggest job of his professional career three years ago. So Tallon, who used to play on the Canadian PGA Tour and still works as a golf pro in the summers, kept the clubs out and his game has become the envy of every other golfing GM in the NHL. Tallon, though, hopes the other 29 managers will soon become envious of his team, too, and if the early returns mean anything there are already hints of jealousy. The hockey revival going on in the Windy City these days has put Chicago back on the map as a hot destination, and while Tallon may lure a big name free agent or two into Blackhawks uniforms when the signing season begins July 1, the Entry Draft is where the Quebec native has done his best work so far. Tallon’s first-round pick from last year – Patrick Kane, who went No. 1 overall – took home the Calder Trophy as the NHL’s Rookie of the Year last week. His first pick in 2006 – Jonathan Toews, third overall – was the second runner-up. Tallon’s first-ever draft pick, highly touted winger Jack Skille from the University of Wisconsin, is expected to be one of the League’s top rookies next season. He was the seventh overall selection in 2005. The Blackhawks pick 11th overall Friday night in Ottawa. Tallon said winning the draft lottery last season set everything in motion. Tallon is downright giddy that he gets to steer the Blackhawks’ new era. It’s why he left his cushy job in the broadcast booth to be the assistant GM early in the 2003-04 season. He took over as the head man in charge when the lockout broke. “I had a nice gig, but I love this,” Tallon said. “I wanted to help rebuild this team. I felt if this opportunity ever came … down deep I always wanted to do this for the challenge, the excitement, the passion, the ups and downs. The challenge facing Tallon when he took over as GM was enormous. The Blackhawks had fallen into the NHL’s abyss. After making the playoffs for 28 straight seasons from 1970-97, they had been there just once (2002) in the seven seasons before Tallon’s hiring. Worse yet, the Hawks were developing little in the way of prospects and struggling to keep their own free agents, or to lure any big names. But in saying that Tallon admits the organization had to learn yet another hard lesson in order to grasp that philosophy. Tallon spent his first month as GM doling out money to free agents Nikolai Khabibulin, Adrian Aucoin, Martin Lapointe and Jaroslav Spacek. With Tyler Arnason, Mark Bell and Kyle Calder also in the mix the expectations were high. Chicago, though, won just 26 games and finished 30 points out of the playoffs in 14th place in the Western Conference. Only the St. Louis Blues and Pittsburgh Penguins had worse seasons. The Hawks still haven’t made the playoffs under Tallon, but they’re creeping closer as their talent grows and farm system improves. They won 31 games in 2006-07 and improved to 40 wins this past season when the revival truly began. Blackhawks’ youngsters Kane, Toews, Skille, Dave Bolland, Adam Burish, Kris Versteeg, Jordan Hendry and Jake Dowell all scored their first NHL goals this past season. The development of kids was only part of the success of this past season. 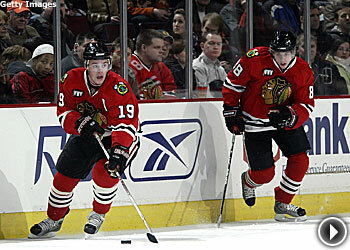 Bid on Chicago Blackhawks memorabilia now! Patrick Sharp, who Tallon acquired two months into the 2005-06 season, not only put together his finest season as a pro – 36 goals and 26 assists – he signed a long-term contract in January. Many of the Blackhawks’ blueliners had big years, too. Brent Sopel and Brent Seabrook showed they wanted to be a part of the renaissance by extending their contracts for another three years. Duncan Keith became an All-Star. Cam Barker, the third overall pick in 2004, showed some promise in 45 games. And Dustin Byfuglien, a D-man turned winger, was one of the biggest surprises in the League with 19 goals and 17 assists in 67 games. Tallon believes the success of this past season – the Hawks also announced every home game would be televised locally and their attendance at the United Center skyrocketed from roughly 12,700 per game in ’06-07 to 16,800 per game in ’07-08 – will grab the attention of the League’s big-name free agents who go on the market July 1. The young guys credit Tallon for the turnaround.